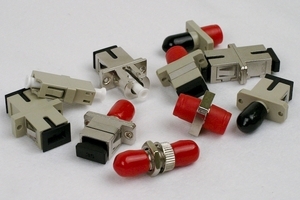 These fiber optic adapters are for connecting multimode cables together where each cable has only one fiber. Be sure that the two cables have the same core size (50/125 or 62.5/125) to avoid excessive loss (attenuation). All these adapters are designed for precision alignment offering high performance and very low insertion losses. They are made from either metal or polymer materials and incorporate ceramic zirconia or phosphor bronze internal alignment sleeves.